This name uses Eastern Slavic naming customs; the patronymic is Fyodorovich and the family name is Stravinsky. Igor Fyodorovich Stravinsky ComSE (/strəˈvɪnski/; Russian: И́горь Фёдорович Страви́нский, IPA: [ˈiɡərʲ ˈfʲɵdərəvʲɪtɕ strɐˈvʲinskʲɪj]; 17 June [O.S. 5 June] 1882 – 6 April 1971) was a Russian-born composer, pianist, and conductor. He is widely considered one of the most important and influential composers of the 20th century. Stravinsky recalled his schooldays as being lonely, later saying that "I never came across anyone who had any real attraction for me". Stravinsky began piano lessons as a young boy, studying music theory and attempting composition. In 1890, he saw a performance of Tchaikovsky's ballet The Sleeping Beauty at the Mariinsky Theatre. By age fifteen, he had mastered Mendelssohn's Piano Concerto in G minor and finished a piano reduction of a string quartet by Glazunov, who reportedly considered Stravinsky unmusical and thought little of his skills. Despite his enthusiasm for music, his parents expected him to study law. Stravinsky enrolled at the University of Saint Petersburg in 1901, but he attended fewer than fifty class sessions during his four years of study. In the summer of 1902, Stravinsky stayed with composer Nikolai Rimsky-Korsakov and his family in the German city of Heidelberg, where Rimsky-Korsakov, arguably the leading Russian composer at that time, suggested to Stravinsky that he should not enter the Saint Petersburg Conservatoire but instead study composing by taking private lessons, in large part because of his age. Stravinsky's father died of cancer that year, by which time his son had already begun spending more time on his musical studies than on law. The university was closed for two months in 1905 in the aftermath of Bloody Sunday: Stravinsky was prevented from taking his final law examinations and later received a half-course diploma in April 1906. Thereafter, he concentrated on studying music. In 1905, he began to take twice-weekly private lessons from Rimsky-Korsakov, whom he came to regard as a second father. These lessons continued until Rimsky-Korsakov's death in 1908. In 1905, Stravinsky was engaged to his cousin Katherine Gavrylivna Nosenko (called "Katya"), whom he had known since early childhood. In spite of the Orthodox Church's opposition to marriage between first cousins, the couple married on 23 January 1906: their first two children, Fyodor (Theodore) and Ludmila, were born in 1907 and 1908, respectively. In February 1909, two of Stravinsky's orchestral works, the Scherzo fantastique and Feu d'artifice (Fireworks) were performed at a concert in Saint Petersburg, where they were heard by Serge Diaghilev, who was at that time involved in planning to present Russian opera and ballet in Paris. Diaghilev was sufficiently impressed by Fireworks to commission Stravinsky to carry out some orchestrations and then to compose a full-length ballet score, The Firebird. From approximately 1890 until 1914 the composer frequently visited Ustilug, a town in the modern Volyn Oblast, Ukraine. He spent most of his summers there, where his father-in-law had an estate. In 1907, Stravinsky designed and built his own house in Ustilug, which he called "my heavenly place". In this house, Stravinsky worked on seventeen of his early compositions, among them Feu d'artifice, The Firebird, Petrushka, and The Rite of Spring. Recently renovated, the house is now a Stravinsky house-museum open to the public. Many documents, letters, and photographs are on display there, and a Stravinsky Festival is held annually in the nearby town of Lutsk. Stravinsky became an overnight sensation following the success of the Firebird's premiere in Paris on 25 June 1910. The composer had travelled from his estate in Ustilug to Paris in early June to attend the final rehearsals and the premiere of The Firebird. His family joined him before the end of the ballet season and they decided to remain in the West for a time, as his wife was expecting their third child. After spending the summer in La Baule, Brittany, they moved to Switzerland in early September. On 23 September, their second son, Sviatoslav Soulima, was born at a maternity clinic in Lausanne; at the end of the month, they took up residence in Clarens. Over the next four years, Stravinsky and his family lived in Russia during the summer months and spent each winter in Switzerland. During this period, Stravinsky composed two further works for the Ballets Russes: Petrushka (1911), and The Rite of Spring (1913). Shortly following the premiere of The Rite of Spring on 29 May 1913, Stravinsky contracted typhoid from eating bad oysters, and was confined to a Paris nursing home, unable to depart for Ustilug until 11 July. During the remainder of the summer, Stravinsky turned his attention to completing his first opera, the Nightingale (usually known by its French title Le Rossignol), which he had begun in 1908 (that is, before his association with the Ballets Russes). The work had been commissioned by the Moscow Free Theatre for the handsome fee of 10,000 rubles. 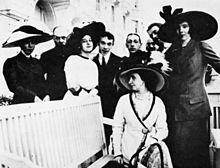 The Stravinsky family returned to Switzerland (as usual) in the fall of 1913. On 15 January 1914, a fourth child, Marie Milène (or Maria Milena), was born in Lausanne. After her delivery, Katya was discovered to have tuberculosis and was confined to the sanatorium at Leysin, high in the Alps. 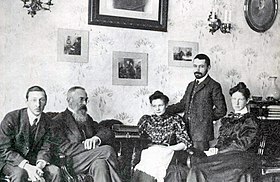 Igor and the family took up residence nearby, and he completed Le Rossignol there on 28 March. In April, they were finally able to return to Clarens. By then, the Moscow Free Theatre had gone bankrupt. As a result, Le Rossignol was first performed under Diaghilev's auspices at the Paris Opéra on 26 May 1914, with sets and costumes designed by Alexandre Benois. Le Rossignol enjoyed only lukewarm success with the public and the critics, apparently because its delicacy did not meet their expectations of the composer of The Rite of Spring. However, composers including Maurice Ravel, Béla Bartók, and Reynaldo Hahn found much to admire in the score's craftsmanship, even alleging to detect the influence of Arnold Schoenberg. In July, with war looming, Stravinsky made a quick trip to Ustilug to retrieve personal effects including his reference works on Russian folk music. He returned to Switzerland just before national borders closed following the outbreak of World War I. The war and subsequent Russian Revolution made it impossible for Stravinsky to return to his homeland, and he did not set foot upon Russian soil again until October 1962. In June 1915, Stravinsky and his family moved from Clarens to Morges, a town six miles south-west of Lausanne on the shore of Lake Geneva. The family lived there (at three different addresses) until 1920. Stravinsky struggled financially during this period. Russia (and its successor, the USSR) did not adhere to the Berne Convention and this created problems for Stravinsky when collecting royalties for the performances of all his Ballets Russes compositions. Stravinsky blamed Diaghilev for his financial troubles, accusing him of failing to live up to the terms of a contract they had signed. He approached the Swiss philanthropist Werner Reinhart for financial assistance while he was writing L'Histoire du soldat (The Soldier's Tale). Reinhart sponsored and largely underwrote its first performance, conducted by Ernest Ansermet on 28 September 1918 at the Théâtre Municipal de Lausanne. In gratitude, Stravinsky dedicated the work to Reinhart and gave him the original manuscript. Reinhart supported Stravinsky further when he funded a series of concerts of his chamber music in 1919: included was a suite from L'Histoire du soldat arranged for violin, piano and clarinet, which was first performed on 8 November 1919, in Lausanne. In gratitude to his benefactor, Stravinsky also dedicated his Three Pieces for Clarinet (October–November 1918) to Reinhart, who was an excellent amateur clarinetist. Following the premiere of Pulcinella by the Ballets Russes in Paris on 15 May 1920, Stravinsky returned to Switzerland. On 8 June, the entire family left Morges for the last time, and moved to the fishing village of Carantec in Brittany for the summer while also seeking a new home in Paris. On hearing of their dilemma, couturière Coco Chanel invited Stravinsky and his family to reside at her new mansion "Bel Respiro" in the Paris suburb of Garches until they could find a more suitable residence; they arrived during the second week of September. At the same time, Chanel also guaranteed the new (December 1920) Ballets Russes production of Stravinsky's The Rite of Spring with an anonymous gift to Diaghilev, said to have been 300,000 francs. Stravinsky formed a business and musical relationship with the French piano manufacturing company Pleyel. Pleyel essentially acted as his agent in collecting mechanical royalties for his works and provided him with a monthly income and a studio space at its headquarters in which he could work and entertain friends and business acquaintances. Under the terms of his contract with the company, Stravinsky agreed to arrange (and to some extent re-compose) many of his early works for the Pleyela, Pleyel's brand of player piano. He did so in a way that made full use of all of the piano's eighty-eight notes, without regard for human fingers or hands. The rolls were not recorded, but were instead marked up from a combination of manuscript fragments and handwritten notes by Jacques Larmanjat, musical director of Pleyel's roll department. Among the compositions that were issued on the Pleyela piano rolls are The Rite of Spring, Petrushka, The Firebird, and Song of the Nightingale. During the 1920s, Stravinsky recorded Duo-Art rolls for the Aeolian Company in both London and New York, not all of which have survived. Patronage was never far away. In the early 1920s, Leopold Stokowski gave Stravinsky regular support through a pseudonymous 'benefactor'. In May 1921, Stravinsky and his family moved to Anglet, near Biarritz, southwestern France. From then until his wife's death in 1939, Stravinsky led a double life, dividing his time between his family in Anglet, and Vera in Paris and on tour. Katya reportedly bore her husband's infidelity "with a mixture of magnanimity, bitterness, and compassion". In September 1924, Stravinsky bought "an expensive house" in Nice: the Villa des Roses. From 1931 to 1933, the Stravinskys lived in Voreppe, near Grenoble, southeastern France. The Stravinskys became French citizens in 1934 and moved to the rue du Faubourg Saint-Honoré in Paris. Stravinsky later remembered this last European address as his unhappiest, as his wife's tuberculosis infected both himself and his eldest daughter Ludmila, who died in 1938. Katya, to whom he had been married for 33 years, died of tuberculosis three months later, in March 1939. Stravinsky himself spent five months in hospital, during which time his mother died. During his later years in Paris, Stravinsky had developed professional relationships with key people in the United States: he was already working on his Symphony in C for the Chicago Symphony Orchestra and he had agreed to deliver the prestigious Charles Eliot Norton Lectures at Harvard University during the 1939–40 academic year. 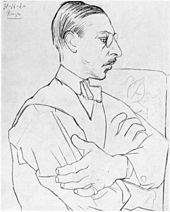 Despite the outbreak of World War II on 1 September 1939, the widowed Stravinsky sailed (alone) for the United States at the end of the month, arriving in New York City and thence to Cambridge, Massachusetts, to fulfill his engagement at Harvard. [page needed] Vera followed him in January, and they were married in Bedford, Massachusetts, on 9 March 1940. Stravinsky settled in West Hollywood. He spent more time living in Los Angeles than any other city. He became a naturalized United States citizen in 1945. Stravinsky had adapted to life in France, but moving to America at the age of 57 was a very different prospect. For a while, he maintained a circle of contacts and émigré friends from Russia, but he eventually found that this did not sustain his intellectual and professional life. He was drawn to the growing cultural life of Los Angeles, especially during World War II, when so many writers, musicians, composers and conductors settled in the area: these included Otto Klemperer, Thomas Mann, Franz Werfel, George Balanchine and Arthur Rubinstein. Bernard Holland claimed Stravinsky was especially fond of British writers, who visited him in Beverly Hills, "like W.H. Auden, Christopher Isherwood, Dylan Thomas. They shared the composer's taste for hard spirits – especially Aldous Huxley, with whom Stravinsky spoke in French". Stravinsky and Huxley had a tradition of Saturday lunches for west coast avant-garde and luminaries. Stravinsky's unconventional dominant seventh chord in his arrangement of the "Star-Spangled Banner" led to an incident with the Boston police on 15 January 1944, and he was warned that the authorities could impose a $100 fine upon any "re-arrangement of the national anthem in whole or in part". The police, as it turned out, were wrong. The law in question merely forbade using the national anthem "as dance music, as an exit march, or as a part of a medley of any kind", but the incident soon established itself as a myth, in which Stravinsky was supposedly arrested, held in custody for several nights, and photographed for police records. Stravinsky's professional life encompassed most of the 20th century, including many of its modern classical music styles, and he influenced composers both during and after his lifetime. Included among his students in the 1940s was the American composer and music educator Robert Strassburg. In 1959, he was awarded the Sonning Award, Denmark's highest musical honour. In the early 1960s his students included Robert Craft and Warren Zevon. In September 1962, Stravinsky returned to Russia for the first time since 1914, accepting an invitation from the Union of Soviet Composers to conduct six performances in Moscow and Leningrad. During the three-week visit he met with Soviet Premier Nikita Khrushchev and several leading Soviet composers, including Dmitri Shostakovich and Aram Khachaturian. In October 1969, Stravinsky relocated to an apartment in Essex House in New York City. Among Stravinsky's final projects was orchestrating two preludes from The Well-Tempered Clavier by Bach, but it was never completed. On 18 March 1971, Stravinsky was taken to Lenox Hill Hospital with pulmonary edema where he stayed for ten days. On 29 March, he moved into a newly furbished apartment at 920 Fifth Avenue, his first city apartment since living in Paris in 1939. After a period of well being, the edema returned on 4 April and Vera insisted for medical equipment to be installed in the apartment. Stravinsky soon stopped eating and drinking and died at 5:20 a.m. on 6 April at the age of 88. The cause on his death certificate is heart failure. A funeral service was held three days later at Frank E. Campbell Funeral Chapel. As per his wishes, he was buried in the Russian corner of the cemetery island of San Michele in northern Italy, several yards from the tomb of Sergei Diaghilev. Aside from a very few surviving earlier works, Stravinsky's Russian period, sometimes called primitive period, began with compositions undertaken under the tutelage of Nikolai Rimsky-Korsakov, with whom he studied from 1905 until Rimsky's death in 1908, including the orchestral works Symphony in E♭ major (1907), Faun and Shepherdess (for mezzo-soprano and orchestra; 1907), Scherzo fantastique (1908), and Feu d'artifice (1908/9). These works clearly reveal the influence of Rimsky-Korsakov, but as Richard Taruskin has shown, they also reveal Stravinsky's knowledge of music by Glazunov, Taneyev, Tchaikovsky, Wagner, Dvořák, and Debussy, among others. In 1908, Stravinsky composed Funeral Song (Погребальная песня), Op. 5 to commemorate the death of Nikolai Rimsky-Korsakov. The piece premiered 17 January 1909 in the Grand Hall of the Saint Petersburg Conservatory but was then lost until September 2015, when it resurfaced in a back room of the city's Conservatoire. It was played again for the first time in over a century on 2 December 2016. The rediscovery generated much enthusiasm and, as a result, over 25 performances are scheduled in 2017 and beyond. Performances in St. Petersburg of Scherzo fantastique and Feu d'artifice attracted the attention of Serge Diaghilev, who commissioned Stravinsky to orchestrate two piano works of Chopin for the ballet Les Sylphides to be presented in the 1909 debut "Saison Russe" of his new ballet company. The Firebird was first performed at the Paris Opéra on 25 June 1910 by Diaghilev's Ballets Russes. Like Stravinsky's earlier student works, The Firebird continued to look backward to Rimsky-Korsakov not only in its orchestration, but also in its overall structure, harmonic organization, and melodic content. According to Taruskin, Stravinsky's second ballet for the Ballet Russes, Petrushka, is where "Stravinsky at last became Stravinsky." The music itself makes significant use of a number of Russian folk tunes in addition to two waltzes by Viennese composer Joseph Lanner and a French music hall tune (La Jambe en bois or The Wooden Leg). In April 1915, Stravinsky received a commission from Winnaretta Singer (Princesse Edmond de Polignac) for a small-scale theatrical work to be performed in her Paris salon. The result was Renard (1916), which he called "A burlesque in song and dance". Renard was Stravinsky's first venture into experimental theatre: the composer's preface to the score specifies a trestle stage on which all the performers (including the instrumentalists) were to appear simultaneously and continuously. In 1951, he completed his last neoclassical work, the opera The Rake's Progress to a libretto by W.H. Auden and Chester Kallman based on the etchings of William Hogarth. It premiered in Venice that year and was produced around Europe the following year before being staged in the New York Metropolitan Opera in 1953. It was staged by the Santa Fe Opera in a 1962 Stravinsky Festival in honor of the composer's 80th birthday and was revived by the Metropolitan Opera in 1997. In the 1950s, Stravinsky began using serial compositional techniques such as dodecaphony, the twelve-tone technique originally devised by Arnold Schoenberg. He first experimented with non-twelve-tone serial techniques in small-scale vocal and chamber works such as the Cantata (1952), the Septet (1953) and Three Songs from Shakespeare (1953). The first of his compositions fully based on such techniques was In Memoriam Dylan Thomas (1954). Agon (1954–57) was the first of his works to include a twelve-tone series and Canticum Sacrum (1955) was the first piece to contain a movement entirely based on a tone row. Stravinsky expanded his use of dodecaphony in works such as Threni (1958) and A Sermon, a Narrative and a Prayer (1961), which are based on biblical texts, and The Flood (1962), which mixes brief biblical texts from the Book of Genesis with passages from the York and Chester Mystery Plays. Stravinsky has been called "one of music's truly epochal innovators". The most important aspect of Stravinsky's work, aside from his technical innovations (including in rhythm and harmony), is the 'changing face' of his compositional style while always 'retaining a distinctive, essential identity'. Stravinsky's use of motivic development (the use of musical figures that are repeated in different guises throughout a composition or section of a composition) included additive motivic development. This is where notes are subtracted or added to a motif without regard to the consequent changes in metre. A similar technique can be found as early as the 16th century, for example in the music of Cipriano de Rore, Orlandus Lassus, Carlo Gesualdo and Giovanni de Macque, music with which Stravinsky exhibited considerable familiarity. The Rite of Spring is notable for its relentless use of ostinati, for example in the eighth-note ostinato on strings accented by eight horns in the section "Augurs of Spring (Dances of the Young Girls)". The work also contains passages where several ostinati clash against one another. Stravinsky was noted for his distinctive use of rhythm, especially in the Rite of Spring (1913). According to the composer Philip Glass, "the idea of pushing the rhythms across the bar lines [...] led the way [...]. The rhythmic structure of music became much more fluid and in a certain way spontaneous". Glass mentions Stravinsky's "primitive, offbeat rhythmic drive". According to Andrew J. Browne, "Stravinsky is perhaps the only composer who has raised rhythm in itself to the dignity of art". Stravinsky's rhythm and vitality greatly influenced the composer Aaron Copland. Over the course of his career, Stravinsky called for a wide variety of orchestral, instrumental, and vocal forces, ranging from single instruments in such works as Three Pieces for Clarinet (1918) or Elegy for Solo Viola (1944) to the enormous orchestra of The Rite of Spring (1913), which Aaron Copland characterized as "the foremost orchestral achievement of the 20th century." Stravinsky’s creation of unique and idiosyncratic ensembles arising from the specific musical nature of individual works is a basic element of his style. Following the model of his teacher, Nikolai Rimsky-Korsakov, Stravinsky’s student works such as the Symphony in E♭, Op. 1 (1907), Scherzo fantastique, Op. 3 (1908), and Fireworks (Feu d'artifice), Op. 4 (1908), call for large orchestral forces. This is not surprising, as the works were as much exercises in orchestration as in composition. The Symphony, for example, calls for 3 flutes (3rd doubles piccolo); 2 oboes; 3 clarinets in B♭; 2 bassoons; 4 horns in F; 3 trumpets in B♭; 3 trombones, tuba, timpani, bass drum, triangle, cymbals, and strings. The Scherzo fantastique calls for a slightly larger orchestra but completely omits trombones: this was Stravinsky’s response to Rimsky’s criticism of their overuse in the Symphony. The Firebird (1910) requires winds in fours, 4 horns, 3 trumpets (in A), 3 trombones, tuba, celesta, 3 harps, piano, and strings. The percussion section calls for timpani, bass drum, cymbals, triangle, tambourine, tamtam, tubular bells, glockenspiel, and xylophone. In addition, the original version calls for 3 onstage trumpets and 4 onstage Wagner tubas (2 tenor and 2 bass). The original version of Petrushka (1911) calls for a similar orchestra (without onstage brass, but with the addition of onstage snare drum). The particularly prominent role of the piano is the result of the music's origin as a Konzertstück for piano and orchestra. Stravinsky displayed a taste in literature that was wide and reflected his constant desire for new discoveries. The texts and literary sources for his work began with a period of interest in Russian folklore, which progressed to classical authors and the Latin liturgy and moved on to contemporary France (André Gide, in Persephone) and eventually English literature, including W.H. Auden, T.S. Eliot, and medieval English verse. Upon relocating to America in the 1940s, Stravinsky again embraced the liberalism of his youth, remarking that Europeans "can have their generalissimos and Führers. Leave me Mr. Truman and I'm satisfied." Towards the end of his life, at Craft's behest, Stravinsky made a return visit to his native country and composed a cantata in Hebrew, travelling to Israel for its performance. Stravinsky was a devout member of the Russian Orthodox Church during most of his life, remarking at one time that, "Music praises God. Music is well or better able to praise him than the building of the church and all its decoration; it is the Church's greatest ornament". I cannot now evaluate the events that, at the end of those thirty years, made me discover the necessity of religious belief. I was not reasoned into my disposition. Though I admire the structured thought of theology (Anselm's proof in the Fides Quaerens Intellectum, for instance) it is to religion no more than counterpoint exercises are to music. I do not believe in bridges of reason or, indeed, in any form of extrapolation in religious matters. ... I can say, however, that for some years before my actual "conversion", a mood of acceptance had been cultivated in me by a reading of the Gospels and by other religious literature. If Stravinsky's stated intention was "to send them all to hell", then he may have rated the 1913 premiere of The Rite of Spring as a success: it is a famous classical music riot and Stravinsky referred to it on several occasions in his autobiography as a scandale. There were reports of fistfights in the audience and the need for a police presence during the second act. The real extent of the tumult is open to debate and the reports may be apocryphal. All the signs indicate a strong reaction against the nightmare of noise and eccentricity that was one of the legacies of the war.... What (for example) has become of the works that made up the program of the Stravinsky concert which created such a stir a few years ago? Practically the whole lot are already on the shelf, and they will remain there until a few jaded neurotics once more feel a desire to eat ashes and fill their belly with the east wind. In 1935, the American composer Marc Blitzstein compared Stravinsky to Jacopo Peri and C.P.E. Bach, conceding that, "there is no denying the greatness of Stravinsky. It is just that he is not great enough". Blitzstein's Marxist position was that Stravinsky's wish to "divorce music from other streams of life", which is "symptomatic of an escape from reality", resulted in a "loss of stamina", naming specifically Apollo, the Capriccio, and Le Baiser de la fée. The composer Constant Lambert described pieces such as L'Histoire du soldat as containing "essentially cold-blooded abstraction". Lambert continued, "melodic fragments in Histoire du Soldat are completely meaningless themselves. They are merely successions of notes that can conveniently be divided into groups of three, five, and seven and set against other mathematical groups" and he described the cadenza for solo drums as "musical purity ... achieved by a species of musical castration". He compared Stravinsky's choice of "the drabbest and least significant phrases" to Gertrude Stein's 'Everyday they were gay there, they were regularly gay there everyday' ("Helen Furr and Georgine Skeene", 1922), "whose effect would be equally appreciated by someone with no knowledge of English whatsoever". In his 1949 book Philosophy of Modern Music, Theodor W. Adorno described Stravinsky as an acrobat and spoke of hebephrenic and psychotic traits in several of Stravinsky's works. Contrary to a common misconception, Adorno didn't believe the hebephrenic and psychotic imitations that the music was supposed to contain were its main fault, as he pointed out in a postscript that he added later to his book. Adorno's criticism of Stravinsky is more concerned with the "transition to positivity" Adorno found in his neoclassical works. Part of the composer's error, in Adorno's view, was his neoclassicism, but of greater importance was his music's "pseudomorphism of painting", playing off le temps espace (time-space) rather than le temps durée (time-duration) of Henri Bergson. According to Adorno, "one trick characterizes all of Stravinsky's formal endeavors: the effort of his music to portray time as in a circus tableau and to present time complexes as though they were spatial. This trick, however, soon exhausts itself". Adorno maintained that the "rhythmic procedures closely resemble the schema of catatonic conditions. In certain schizophrenics, the process by which the motor apparatus becomes independent leads to infinite repetition of gestures or words, following the decay of the ego". Stravinsky's reputation in Russia and the USSR rose and fell. Performances of his music were banned from around 1933 until 1962, the year Nikita Khrushchev invited him to the USSR for an official state visit. In 1972, an official proclamation by the Soviet Minister of Culture, Yekaterina Furtseva, ordered Soviet musicians to "study and admire" Stravinsky's music and she made hostility toward it a potential offence. [specify] While Stravinsky's music has been criticized for its range of styles, scholars had "gradually begun to perceive unifying elements in Stravinsky's music" by the 1980s. 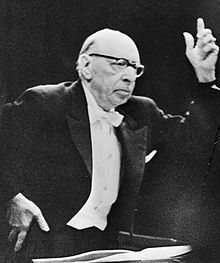 Earlier writers, such as Aaron Copland, Elliott Carter, and Boris de Schloezer held somewhat unfavorable views of Stravinsky's works, and Virgil Thomson, writing in Modern Music (a quarterly review published between 1925 and 1946), could find only a common "'seriousness' of 'tone' or of 'purpose', 'the exact correlation between the goal and the means', or a dry 'ant-like neatness'". Igor Stravinsky found recordings a practical and useful tool in preserving his thoughts on the interpretation of his music. As a conductor of his own music, he recorded primarily for Columbia Records, beginning in 1928 with a performance of the original suite from The Firebird and concluding in 1967 with the 1945 suite from the same ballet. In the late 1940s he made several recordings for RCA Victor at the Republic Studios in Los Angeles. Although most of his recordings were made with studio musicians, he also worked with the Chicago Symphony Orchestra, the Cleveland Orchestra, the CBC Symphony Orchestra, the New York Philharmonic Orchestra, the Royal Philharmonic Orchestra and the Bavarian Broadcasting Symphony Orchestra. During his lifetime, Stravinsky appeared on several telecasts, including the 1962 world premiere of The Flood on CBS Television. Although he made an appearance, the actual performance was conducted by Robert Craft. Numerous films and videos of the composer have been preserved. Stravinsky published a number of books throughout his career, almost always with the aid of a (sometimes uncredited) collaborator. In his 1936 autobiography, Chronicle of My Life, which was written with the help of Walter Nouvel, Stravinsky included his well-known statement that "music is, by its very nature, essentially powerless to express anything at all". With Alexis Roland-Manuel and Pierre Souvtchinsky, he wrote his 1939–40 Harvard University Charles Eliot Norton Lectures, which were delivered in French and first collected under the title Poétique musicale in 1942 and then translated in 1947 as Poetics of Music. In 1959, several interviews between the composer and Robert Craft were published as Conversations with Igor Stravinsky, which was followed by a further five volumes over the following decade. A collection of Stravinsky's writings and interviews appears under the title Confidences sur la musique (Actes Sud, 2013). ^ Walsh, Stephen (1999). "Stravinsky: A Creative Spring: Russia and France, 1882–1934 (excerpt)". The New York Times. New York City, New York: The New York Times. Archived from the original on 6 March 2016. Retrieved 24 June 2017. 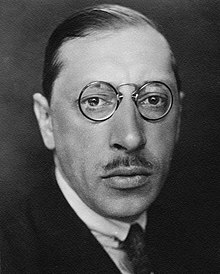 The Stravinsky family, like the name, is Polish, a fact which needs to be stressed in view of recent and perfectly understandable attempts by Kiev scholars to claim Stravinsky as a Ukrainian of Cossack lineage. The so-called Soulima-Stravinskys are more accurately described as ‘Strawinscy Herbu Sulima,’ to adopt for the moment the old Polish spelling of the two names: that is, the Strawinscy family with the Sulima coat-of-arms. This simply means, for our purposes, that this branch of the Strawinscys claimed descent from the more ancient – probably German – house of Sulima. Stefan Strawinski traced the family tree back to the late sixteenth century, when the Strawinscys held high state office, in a kingdom where there were no hereditary titles and power was symbolized by honorific titles associated with purely ceremonial duties. ^ Stravinsky and Craft 1960, p. 17. ^ Stravinsky and Craft 1960, p. 6. ^ a b Dubal 2001, p. 565. ^ White 1979, p. 8. ^ a b Palmer 1982. ^ Walsh 2000, p. 83. ^ Stravinsky 1962, p. 24. ^ a b White 1979, p. 5. ^ White 1979, pp. 11–12. ^ White 1979, pp. 15–16. ^ "Igor Stravinsky public museum in Ustyluh". Museums of the Volyn. ^ White 1979, p. 12. ^ "A virtual tour of the house-museum of Igor Stravinsky in Ustylug". House Museum of Igor Stravinsky in Ustylug. incognita.day.kiev.ua. ^ Sadie, Julie Anne, Sadie, Stanley (2005). Calling on the Composer. Yale University Press. p. 360. ISBN 0-300-18394-1. ^ "International Music Festival "Stravinsky and Ukraine" | About Lutsk". www.visitlutsk.com. Retrieved 2018-01-24. ^ Walsh 2000, pp. 142–43. ^ Walsh 2000, p. 140. ^ Walsh 2000, p. 145. ^ White 1979, p. 33. ^ V. Stravinsky and Craft 1978, pp. 100, 102. ^ V. Stravinsky and Craft 1978, pp. 111–14. ^ V. Stravinsky and Craft 1978, p. 113. ^ Walsh 2000, p. 224. ^ a b V. Stravinsky and Craft 1978, p. 119. ^ a b Walsh 2000, p. 233. ^ Walsh 2000, p. 230. ^ V. Stravinsky and Craft 1978, p. 120. ^ Oliver 1995, p. 74. ^ V. Stravinsky and Craft 1978, p. 469. ^ V. Stravinsky and Craft 1978, pp. 136–37. ^ White 1979, p. 85. ^ White 1979, pp. 47–48. ^ Keller 2011, p. 456. ^ Stravinsky 1962, p. 83. ^ White 1979, p. 50. ^ Walsh 2000, p. 313. ^ Walsh 2000, p. 315. ^ Walsh 2000, p. 318. ^ Walsh 2000, p. 319 and fn 21. ^ Compositions for Pianola Retrieved 3 March 2012. ^ White 1979, p. 573. ^ Lawson 1986, pp. 298–301. ^ See "Stravinsky, Stokowski and Madame Incognito", Craft 1992, pp. 73–81. ^ Walsh 2000, p. 336. ^ Vera de Bosset Sudeikina (Vera Stravinsky) profile at bbc.co.uk. Retrieved 3 March 2012. ^ Walsh 2000, p. 329. ^ Cooper 2000, p. 306. ^ Joseph 2001, p. 73. ^ Walsh 2000, p. 193. ^ Biography page on the Foundation dedicated to Theodore Strawinsky, son of Igor Stravinsky (in French) Retrieved 15 March 2017. ^ White 1979, pp. 77, 84. ^ White 1979, p. 9. ^ Stravinsky and Craft 1960, p. 18. ^ Joseph 2001, p. 279. ^ Walsh 2006, p. 595. ^ White 1979, p. 93. ^ White 1979, p. 390. ^ According to Michael Steinberg's liner notes to Stravinsky in America, RCA 09026-68865-2, p. 7, the police "removed the parts from Symphony Hall", quoted in Thom 2007, p. 50. ^ "Mass. Gen. Laws ch. 249, § 9". ^ Walsh 2006, p. 152. ^ Pfitzinger, Scott (1 March 2017). Composer Genealogies: A Compendium of Composers, Their Teachers, and Their Students. Rowman & Littlefield. ISBN 978-1-4422-7225-5. Retrieved 25 November 2017 – via Google Books. ^ George Plasketes (2016). Warren Zevon: Desperado of Los Angeles. Rowman & Littlefield. pp. 6–7. ISBN 978-1-4422-3457-4. ^ White 1979, pp. 146–48. ^ "Stravinsky in Russia after 52 years away". The Evening Sun. 21 September 1962. p. 3. Retrieved 7 January 2019 – via Newspapers.com. ^ a b "Igor Stravinsky, the Composer, Dead at 88". The New York Times. ^ Walsh 2006, p. 560. ^ Walsh 2006, p. 561. ^ Ruff, Willie (1991-07-24). A Call to Assembly: The Autobiography of a Musical Storyteller. BookBaby. ISBN 978-1-62488-841-0. ^ Walsh 2000, pp. 543–44. ^ Taruskin 1996, I: pp. 163–368, chapters 3–5. ^ Walsh, Stephen (6 September 2015). "Key Igor Stravinsky work found after 100 years". The Guardian. Archived from the original on 8 September 2015. ^ "Stravinsky's 107-year-old Funeral Song to travel the globe". www.boosey.com. Retrieved 25 November 2017. ^ Walsh 2000, p. 122. ^ See: "Table I: Folk and Popular Tunes in Petrushka." Taruskin 1996, vol. I, pp. 696–97. ^ Griffiths, Stravinsky, Craft, and Josipovici 1982, pp. 49–50. ^ Straus 2001, p. 4. ^ White 1979, p. 510. ^ White 1979, p. 517. ^ a b AMG 2008. "Igor Stravinsky" biography, AllMusic. ^ Stravinsky and Craft 1960, pp. 116–17. ^ Browne 1930, p. 360. ^ Copland 1952, p. 37. ^ Taruskin 1998, p. 325..
^ Walsh 2000, p. 276. ^ Olivier Berggruen, "Stravinsky and Picasso: Elective Affinities", in Picasso: Between Cubism and Neoclassicism, 1915–1925, ed. Olivier Berggruen (Milan: Skira, 2018). ISBN 88-572-3693-5. ^ a b Stravinsky and Craft 1959. ^ Taruskin 1996, p. 1514. ^ Sachs 1987, p. 168. ^ Taruskin and Craft 1989. ^ Mitchinson, Paul (2006-05-11). "The Composer's Craft". The Nation. ^ Walsh, Stephen. Stravinsky: The Second Exile: France and America, 1934–1971. Knopf Doubleday Publishing Group. ^ Morand 1976, pp. 121–24. ^ Davis 2006, p. 439. ^ Fact-or-fiction Chanel-Stravinsky affair curtains Cannes. Swiss News, 25 May 2009. Retrieved 28 December 2010. ^ T. Strawinsky and D. Strawinsky 2004. ^ "Stravinsky's quotations". Brainyquote.com. 6 April 1971. Retrieved 9 March 2010. ^ Stravinsky and Craft 1969, p. 198. ^ Stravinsky and Craft 1960, p. 51. ^ Stravinsky and Craft 1966, pp. 172–75. ^ Copeland 1982, p. 565, quoting Stravinsky and Craft 1962, pp. 63–64. ^ Wenborn (1985, p. 17) alludes to this comment, without giving a specific source. ^ See Eksteins 1989, pp. 10–16 for an overview of contradictory reportage of the event by participants and the press. ^ Volta 1989, first pages of chapter on contemporaries. ^ "Occasional Notes", The Musical Times and Singing-Class Circular 64, no. 968 (1 October 1923): 712–15, quotation on 713. ^ Blitzstein 1935, p. 330. ^ Blitzstein 1935, pp. 346–47. ^ Lambert 1936, p. 94. ^ Lambert 1936, pp. 101–05. ^ Adorno 2006, p. 167. ^ Adorno 1973, pp. 206–09. ^ Adorno 1973, pp. 191–93. ^ Adorno 1973, p. 195. ^ Adorno 1973, p. 178. ^ Karlinsky 1985, p. 282. ^ "Books -". Tempo (118): 39–40. 1976. doi:10.1017/S004029820002845X. Retrieved 25 November 2017 – via Cambridge Core. ^ Pasler 1983, p. 608. ^ a b c "1962 Grammy Awards". Infoplease. 5 March 2012. Retrieved 15 March 2012. ^ "Miniature masterpieces". Fondation Igor Stravinsky. Retrieved 2 November 2011. ^ "Igor Stravinsky – Flood – Opera". Boosey.com. Retrieved 2 November 2011. ^ Stravinsky 1936, pp. 91–92. ^ The names of uncredited collaborators are given in Walsh 2001. Hazlewood, Charles. 2003. "Stravinsky –The Firebird Suite". On Discovering Music. BBC Radio 3 (20 December). Archived at Discovering Music: Listening Library, Programmes. 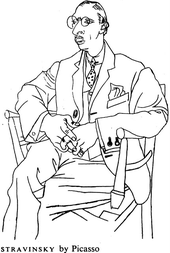 Wikimedia Commons has media related to Igor Stravinsky. An archive recording of a radio program by William Malloch that includes a discussion of how attitudes toward Stravinsky’s music changed through the years. Included are excepts from The Firebird, Petrouchka and The Rite of Spring recorded from the 1930s to the 1950s by a variety of conductors, including the composer himself. This page was last edited on 16 April 2019, at 23:33 (UTC).